Did you know that hernias are actually pretty common in kids, and babies can be born with them, even premature babies? The good news is that hernias can be easy to treat, as long as they are spotted quickly and the baby gets the proper medical care as soon as possible. What Should I Know About Baby Hernia? A hernia is a lump under the skin. It might vary in size, and typically happens in the groin or belly. In most cases, the muscles across the belly and pelvis form a barrier that keeps all internal organs in place. But when a gap occurs in that wall, a hernia can develop. A hernia is created by part of the baby’s abdomen, or even his intestines, pushing through that gap. That’s what creates the lump. There are two types of hernias: umbilical and inguinal. The umbilical hernia happens around the belly button, while the inguinal hernia appears in the groin area. 2. What Are the Symptoms of Hernia? Sometimes a hernia is easy to spot, and you can see it right away. But in other cases, the hernia might not be seen until the baby cries, coughs, or uses the bathroom. Then the pressure on the abdomen makes the hernia press out against the skin, forming the tell-tale lump. In most cases, the hernia goes away when the abdominal pressure does. But other times, the tissue can be “caught” by the hole, and it can bulge out all the time. This kind of hernia doesn’t go away when your baby stop crying, and it becomes very hard and painful to the touch. Your baby might also start vomiting and otherwise feeling awful. This is a sign of a strangulated hernia, which means part of the bowel has been trapped and is being squeezed. This is an emergency–get to the doctor immediately! 3. What Causes a Baby Hernia? When a baby is born, there is a ring of muscle and tissue around the umbilical cord. This ring usually closes before birth, but sometimes it doesn’t. That opening becomes a hernia. Sometimes the opening in the groin happen simply because the baby’s muscles haven’t matured enough to hold in the pressure of the abdomen. Experts aren’t sure why either one of these things happens. 4. Are There Any Complications? 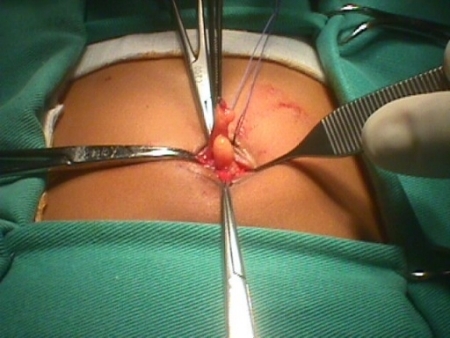 Fortunately, most umbilical hernias go away without treatment. They simply “disappear” as your baby’s muscles become stronger. But an inguinal hernia is another story, as the bowel can easily become trapped before the hernia can close. Since this problem is common, many doctors will recommend surgery to repair the hernia before complications can begin. Other reasons for surgery are if the hernia persists for a long while or is very large. What Are the Risk Factors for Developing a Baby Hernia? Sometimes hernias appear with no reason at all. But there are some risk factors that might indicate if your baby has a higher risk of a hernia. These include a parent or sibling who had a hernia as an infant, cystic fibrosis, developmental dysplasia of the hip, undescended testes and abnormalities of the urethra. Inguinal hernias occur in one to three percent of all children and are more common in premature infants. They occur much more frequently in boys than in girls, and much more often in the right groin rather than the left. However, when a hernia appears on one side, it might appear on the other side at a later date. Umbilical hernias are more common, occurring in about ten percent of all children. They are more common in girls than in boys, and happen more often in premature infants or those of African-American descent. How Is a Baby Hernia Treated? Treatment for a baby hernia depends upon where it is and how bad it is. In some cases, your doctor might be able to gently push the hernia back in, but never try this yourself as your baby could be injured. In some cases simply pushing the hernia back in does the trick, but in other cases, surgery is required. Surgery is a relatively simple procedure in which the hernia is pushed back into place, then the muscles are stitched shut. In many cases, the surgery is so routine that the child can come home the same day the surgery is performed. Very young children or those who have other medical problems might be kept overnight for observation after the surgery.